Just when it looked like the steel industry in the United States was history the steel mills that survived are doing better than ever, thanks to the high worldwide price of steel. The railroads being the main means of transportation for the steel industry are welcoming the success of the American steel industry. I would like to share with you my switching operations on my railroad The Streator Connection. 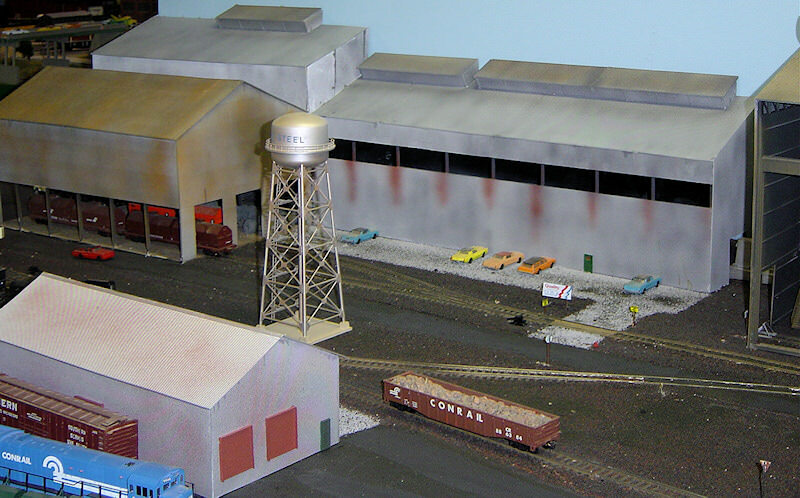 The switching operations center on the Steel mill which is mostly made up of the Walthers kit, I have scratch built a few structures within the mill. A steel mill receives raw materials in various cars and ships finished goods in a variety of cars. A steel mill has an enormous appetite for coal, scrap and iron ore. Coal is brought in and converted to coke at the coke oven, the coke is then mixed with iron ore along with limestone at the blast furnace to make molten steel. The molten steel is transported to the electric furnace via bottle cars. 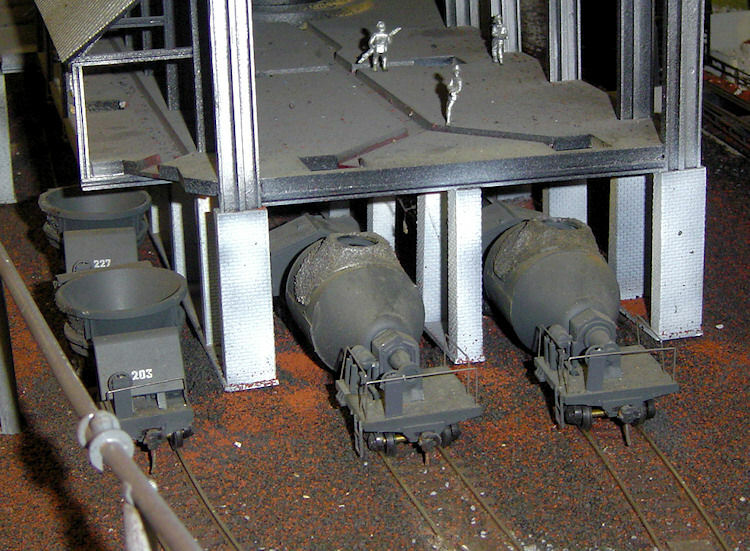 On my layout the electric furnace is within the same complex as the blast furnace; however some steel mills have these facilities miles apart which require the bottle cars to travel the railroad mainline. At the Electric furnace scrap is melted and mixed with the molten metal to form steel. Loading hot iron into bottle cars at the Streator mill. The finished product at the steel mill is naturally steel, the steel can be in the form of beams, pipe or coils. My particular mill produces steel coils; these steel coils leave the mill in gondolas or coil cars. A by-product of the coke making process is tar, so my steel mill has a tar loading facility which loads tank cars. Another by-product of the steel making process is slag, slag is used a cheap fill for building projects, slag is shipped from the mill in hopper cars. I have various industries that receive coil steel, I have a pipe plant that receives coil steel cars and ships pipe out in gondolas. I have an auto parts plant that receives coil cars and ships out auto beam plant those coverts coils of steel into steel beams and ships these beams out in gondolas and flat cars. I also have a large trans-loading facility for unloading coils as well as pipe and beams from rail cars to trucks. Coal unloading at the Streator steel mill coal dump. When I operate I send out unit coal and ore trains from staging to the steel mill. A dedicated local is built in the main classification yard and takes loaded gondolas of scrap, loaded hoppers of limestone along with empty coil cars to the steel mill. 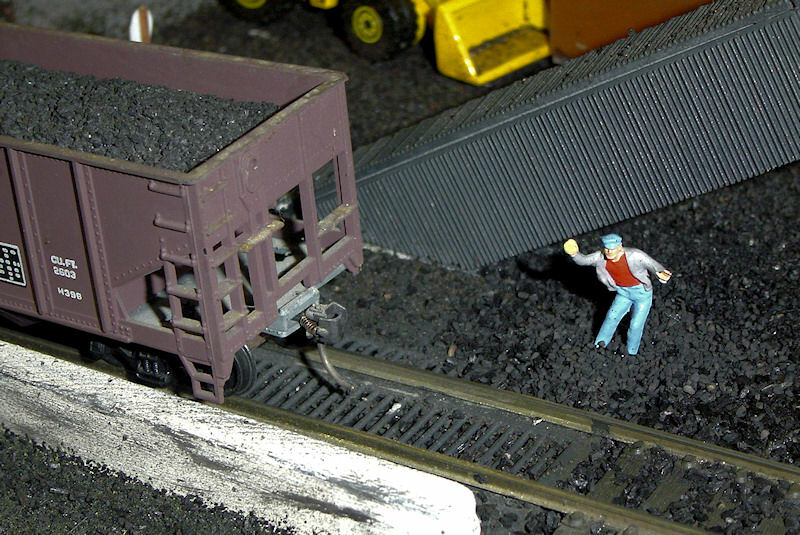 The local then returns with loaded coil cars, tank cars of tar and hoppers full of slag. 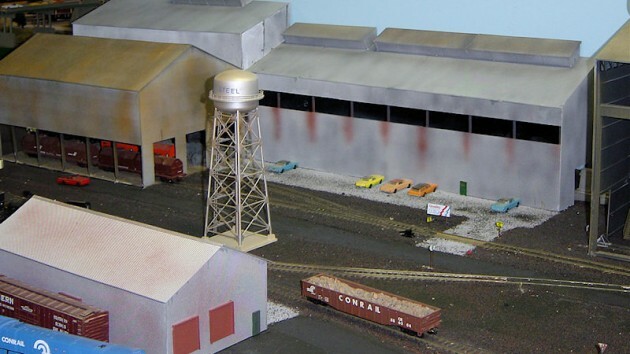 The cars are classified in the yard and then sent to the various industries mentioned earlier around the layout that use steel. I also have a large scrap yard that ships gondolas of scrap for use in the steel mill which the mainline locals bring into the classification yard. The steel mill has its own yard which the local drops off and picks cars up. The mill has its own switch engine that moves cars around the steel mill. My locals are made up of one engine, usually a GP-38 or GP-40, my only piece of brass, a Conrail transfer caboose brings up the rear of the steel mill local. Coal tar tank car loading at the Streator steel mill. To try to add realism I tried to separate the industries that use or supply products of the mill by placing these industries where a scenic divider separates them from the view of the steel mill. To generate scrap for the scrap yard, I use Walthers industrial dumpsters 933-3516 at my industries to collect scrap metal. Curt Regensberger is a graduate of McKendree University and is an accountant working for the Illinois Department Of Revenue. 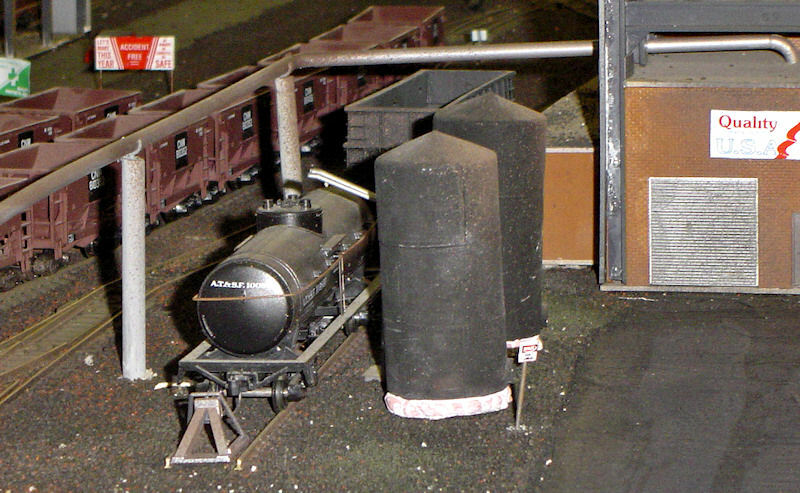 He is a second generation model railroader which stated that is his hobby for life. He is married and lives in Swanse, Illinois.